About 10 years ago, as I was working with the Restoration Workshop of Nidaros Cathedral, the first phase of a conservation project for the murals was completed. This phase was mainly related to the west wall that is strongly influenced by salt weathering. Since then the condition of the murals and the indoor climate have been monitored. 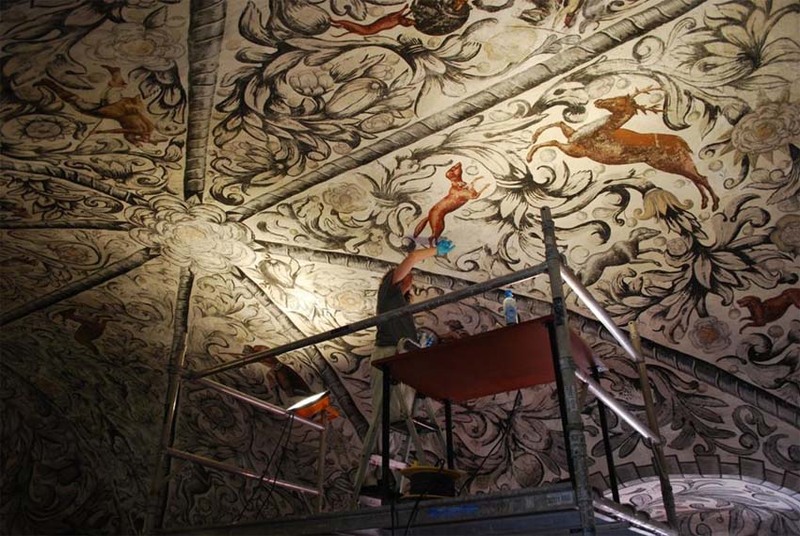 In 2009 the Restoration Workshop, which is responsible for the Archbishop’s Palace, decided to continue the project, considering all the paintings in the room. Just like 10 years ago, conservator Andreas Franz joined the project and together we mapped all visible damages to the paintings, using Andreas’ Divisual mapping system. Many problems are related to poor original mortars, others to fissures and cracks, and previous water infiltration. A next stept was securing loose fragments of paint and plaster, done by Andreas together with Silke Zeich, while I worked on assessing the risks to the paintings, especially by comparing the current condition with what can be seen on old photos, thus getting an idea of weathering rates. Conservation work and monitoring will continue and I will post updates when reports become available. This entry was posted in Monument conservation, New projects, Norway and tagged Archbishop's Palace, conservation, Erkebispegården, mural painting, Nidaros Cathedral, Nidarosdomen, Norway, Trondheim, weathering. Bookmark the permalink.